After declaring NEET-PG Rank cards, National Board of Education has now released the Detailed list of the candidates who appeared in NEET PG 2018. 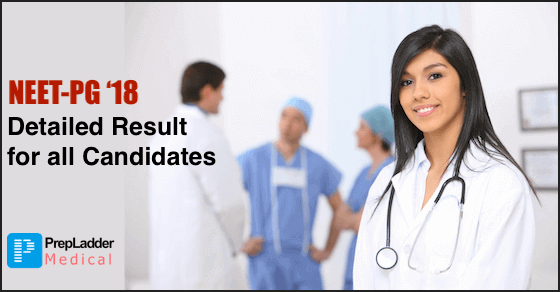 The list contains details such as Roll Number, Score and All India Rank of the candidates. PrepLadder has arranged the list according to ranks for you to understand and scan easly. You can also check your AIR, even if you did not clear the cut-off. In September 2017, months prior to NEET-PG 2018 exam, we received a large number of queries from the aspirants as to predict the number of candidates who will appear in NEET PG 2018. Prepladdder predicted that an approximate of 1,24,000 candidates will appear in NEET PG 2018. From the detailed list of 'All Appeared' candidates, it is evident that 1,28,775 candidates apperaed for the NEET PG 2018. This reflects the accuracy of PrepLadder’s prediction. This list will enable to view the result of all candidates who apperaed in NEET PG along with their Scores and All India Ranks.